National Night Out is Tuesday, Oct. 2, 2018, from 7 to 9 p.m. Neighborhoods must register by 5 p.m. on Friday, September 14, 2018. 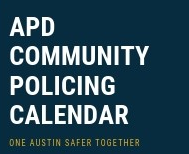 Austin Police Department Office of Community Liaison Attn: Veronica Saldate. Phone: (512) 974-4735. Which public safety agency would you like to visit your party? Will your NNO Party take place in a secured, gated area or community? If yes, contact APD with your gate entry information.